During building work at the Eight Bells public house in 1970 a miniature almanac, measuring just 2 x 1.5 inches, was found secreted away inside a dowel hole in a timber beam. In December 2017 it was taken from its display case inside the pub by Hatfield Local History Society member Jon Brindle and given to historians at the University of Hertfordshire, who carefully scanned every page. Kind information from Shannon Struble, an antiquarian bookseller in the USA, described it as “an uncommon London Almanac” which was printed in 1734 by the Company of Stationers. It recorded such things as the church calendar, astrological dates, sunrise and sunset, lists of monarchs from 1066, London Lord Mayors from 1709 and Sheriffs. 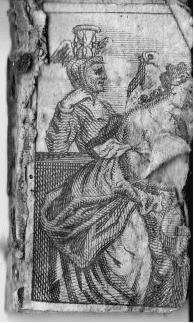 There are a few illustrations including on figure wearing a large, winged hourglass on his head, perhaps to denote the passage of times. There were also depictions of King George II and the publisher’s own coat of arms. 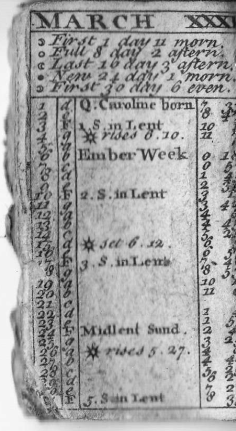 The page for March shows that the week beginning March 6th was an ‘Ember Week’. These were four weeks in the church calendar, spaced equally throughout the year – one for each season. The Wednesday, Friday and Saturday of that week were set apart for fasting and giving thanks for the gifts of nature. The modern day Harvest Festival perhaps has connections to these largely forgotten Ember Week traditions. Unfortunately the almanac’s cover was missing but 38 pages are still intact. Ms Struble noted that it had been “...disbound and sewn back together..” rather than glued, as it originally would have been. This was the likely reason for some intermittent blank pages inside. But it is on these pages that we learn something about its owner. Handwriting on a blank page informs that this tiny book was given to Edward Hoy by his sister Mary Hoy in 1754. By then, the book was 20 years old. There were also a couple of childlike drawings of animals on other blank pages. A part history of the Hoys is also interesting. 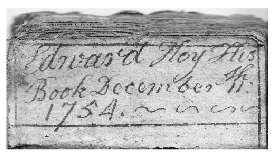 The grandfather of the above children was an Edward Hoy who died in 1728. He was a fellmonger – a dealer in animal skins for tanning. He would have obtained them from a local butcher or abattoir in the Old Town and prepared them at his shop in Batterdale – which also had a tannery. The original Batterdale was about 50 yds. south of the pub opposite Church Street. A 19th century conveyance relating to earlier details of a property in Fore Street refers to: “…all that messuage or tenement adjoining to the Brewhouse in the possession of Edward Hoy, fellmonger, together with the barn and outhouse, piece of garden and two stables adjoining to the great barn and yard in common…“. Is it possible that old Edward’s brewhouse provided the beer for a pub? His Pub? If so, was the pub the Five Bells (later known as the Eight Bells)? Did he live there? We don’t know, but it is tempting to think that there was some family connection which resulted in the almanac being found in the pub. But we do know he had two sons: Edward Jnr. 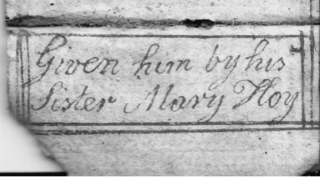 and Charles, also that Charles and wife Elizabeth’s children – Edward and Mary – were baptised in 1741 and 1744 respectively; and these must be the siblings referred to in the almanac. They would have been aged 14 yrs. and 10 yrs. when Mary gifted it to her brother in 1754. They both died relatively young, predeceasing their father , Charles, who died in 1782 and their uncle, Edward Hoy Jnr. who lived on until 1783. He was a breeches and glove maker, operating from his father’s old fellmonger workshop in Batterdale. With thanks to: Robin Harcourt Williams, Prof. Owen Davies, Shannon Struble, the WEA, and the Eight Bells landlord Andy Parish. This page was added on 01/03/2018.